Citation Information: J Clin Invest. 2009. https://doi.org/10.1172/JCI38499. HIF transcription factors (HIF-1 and HIF-2) are central mediators of cellular adaptation to hypoxia. Because the resting partial pressure of oxygen is low in the intestinal lumen, epithelial cells are believed to be mildly hypoxic. Having recently established a link between HIF and the iron-regulatory hormone hepcidin, we hypothesized that HIFs, stabilized in the hypoxic intestinal epithelium, may also play critical roles in regulating intestinal iron absorption. To explore this idea, we first established that the mouse duodenum, the site of iron absorption in the intestine, is hypoxic and generated conditional knockout mice that lacked either Hif1a or Hif2a specifically in the intestinal epithelium. Using these mice, we found that HIF-1α was not necessary for iron absorption, whereas HIF-2α played a crucial role in maintaining iron balance in the organism by directly regulating the transcription of the gene encoding divalent metal transporter 1 (DMT1), the principal intestinal iron transporter. Specific deletion of Hif2a led to a decrease in serum and liver iron levels and a marked decrease in liver hepcidin expression, indicating the involvement of an induced systemic response to counteract the iron deficiency. This finding may provide a basis for the development of new strategies, specifically in targeting HIF-2α, to improve iron homeostasis in patients with iron disorders. Citation Information: J Clin Invest. 2009;119(4):1052-1052. https://doi.org/10.1172/JCI37409C1. Citation Information: J Clin Invest. 2009. https://doi.org/10.1172/JCI37409. Citation Information: J Clin Invest. 2009. https://doi.org/10.1172/JCI35541. The epithelial anion channel CFTR interacts with multiple PDZ domain–containing proteins. Heterologous expression studies have demonstrated that the Na+/H+ exchanger regulatory factors, NHERF1, NHERF2, and PDZK1 (NHERF3), modulate CFTR membrane retention, conductivity, and interactions with other transporters. To study their biological roles in vivo, we investigated CFTR-dependent duodenal HCO3– secretion in mouse models of Nherf1, Nherf2, and Pdzk1 loss of function. We found that Nherf1 ablation strongly reduced basal as well as forskolin-stimulated (FSK-stimulated) HCO3– secretory rates and blocked β2-adrenergic receptor (β2-AR) stimulation. Conversely, Nherf2–/– mice displayed augmented FSK-stimulated HCO3– secretion. Furthermore, although lysophosphatidic acid (LPA) inhibited FSK-stimulated HCO3– secretion in WT mice, this effect was lost in Nherf2–/– mice. Pdzk1 ablation reduced basal, but not FSK-stimulated, HCO3– secretion. In addition, laser microdissection and quantitative PCR revealed that the β2-AR and the type 2 LPA receptor were expressed together with CFTR in duodenal crypts and that colocalization of the β2-AR and CFTR was reduced in the Nherf1–/– mice. These data suggest that the NHERF proteins differentially modulate duodenal HCO3– secretion: while NHERF1 is an obligatory linker for β2-AR stimulation of CFTR, NHERF2 confers inhibitory signals by coupling the LPA receptor to CFTR. Citation Information: J Clin Invest. 2008. https://doi.org/10.1172/JCI33227. The proinflammatory cytokine IL-6 seems to have an important role in the intestinal inflammation that characterizes inflammatory bowel diseases (IBDs) such as Crohn disease and ulcerative colitis. However, little is known about the molecular mechanisms regulating IL-6 production in IBD. Here, we assessed the role of the transcriptional regulator IFN regulatory factor–4 (IRF4) in this process. Patients with either Crohn disease or ulcerative colitis exhibited increased IRF4 expression in lamina propria CD3+ T cells as compared with control patients. Consistent with IRF4 having a regulatory function in T cells, in a mouse model of IBD whereby colitis is induced in RAG-deficient mice by transplantation with CD4+CD45RBhi T cells, adoptive transfer of wild-type but not IRF4-deficient T cells resulted in severe colitis. Furthermore, IRF4-deficient mice were protected from T cell–dependent chronic intestinal inflammation in trinitrobenzene sulfonic acid– and oxazolone-induced colitis. In addition, IRF4-deficient mice with induced colitis had reduced mucosal IL-6 production, and IRF4 was required for IL-6 production by mucosal CD90+ T cells, which it protected from apoptosis. Finally, the protective effect of IRF4 deficiency could be abrogated by systemic administration of either recombinant IL-6 or a combination of soluble IL-6 receptor (sIL-6R) plus IL-6 (hyper–IL-6). Taken together, our data identify IRF4 as a key regulator of mucosal IL-6 production in T cell–dependent experimental colitis and suggest that IRF4 might provide a therapeutic target for IBDs. Citation Information: J Clin Invest. 2008. https://doi.org/10.1172/JCI34324. Citation Information: J Clin Invest. 2008. https://doi.org/10.1172/JCI34425. Mutations in the RET gene are the primary cause of Hirschsprung disease (HSCR), or congenital intestinal aganglionosis. However, how RET malfunction leads to HSCR is not known. It has recently been shown that the binding of glial cell line–derived neurotrophic factor (GDNF) to GDNF family receptor α1 (GFRα1) activates RET and is essential for the survival of enteric neurons. In this study, we investigated Ret regulation of enteric neuron survival and its potential involvement in HSCR. Conditional ablation of Ret in postmigratory enteric neurons caused widespread neuronal death in the colon, which led to colonic aganglionosis. To further examine this finding, we generated a mouse model for HSCR by reducing Ret expression levels. These mice recapitulated the genetic and phenotypic features of HSCR and developed colonic aganglionosis due to impaired migration and successive death of enteric neural crest–derived cells. 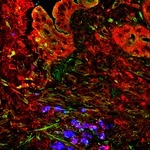 Death of enteric neurons was also induced in the colon, where reduction of Ret expression was induced after the period of enteric neural crest cell migration, indicating that diminished Ret expression directly affected the survival of colonic neurons. Thus, enteric neuron survival is sensitive to RET dosage, and cell death is potentially involved in the etiology of HSCR. Citation Information: J Clin Invest. 2008. https://doi.org/10.1172/JCI32140. IL-10 is an immunomodulatory cytokine that plays an obligate role in preventing spontaneous enterocolitis in mice. However, little is known about IL-10 function in the human intestinal mucosa. We showed here that IL-10 was constitutively expressed and secreted by the human normal colonic mucosa, including epithelial cells. Depletion of IL-10 in mucosal explants induced both downregulation of the IL-10–inducible, immunosuppressive gene BCL3 and upregulation of IFN-γ, TNF-α, and IL-17. Interestingly, TGF-β blockade also strongly induced IFN-γ production. In addition, the high levels of IFN-γ produced upon IL-10 depletion were responsible for surface epithelium damage and crypt loss, mainly by apoptosis. Polymyxin B, used as a scavenger of endogenous LPS, abolished both IFN-γ production and epithelial barrier disruption. Finally, adding a commensal bacteria strain to mucosa explant cultures depleted of both IL-10 and LPS reproduced the ability of endogenous LPS to induce IFN-γ secretion. These findings demonstrate that IL-10 ablation leads to an endogenous IFN-γ–mediated inflammatory response via LPS from commensal bacteria in the human colonic mucosa. We also found that both IL-10 and TGF-β play crucial roles in maintaining human colonic mucosa homeostasis. Citation Information: J Clin Invest. 2008. https://doi.org/10.1172/JCI33145. The mechanisms underlying the susceptibility of individuals with caspase recruitment domain 15 (CARD15) mutations and corresponding abnormalities of nucleotide-binding oligomerization domain 2 (NOD2) protein to Crohn disease are still poorly understood. One possibility is based on previous studies showing that muramyl dipeptide (MDP) activation of NOD2 negatively regulates TLR2 responses and that absence of such regulation leads to heightened Th1 responses. We now report that administration of MDP protects mice from the development of experimental colitis by downregulating multiple TLR responses, not just TLR2. The basis of these in vivo findings was suggested by in vitro studies of DCs, in which we showed that prestimulation of cells with MDP reduces cytokine responses to multiple TLR ligands and this reduction is dependent on enhanced IFN regulatory factor 4 (IRF4) activity. Further studies of mouse models of colitis showed that this inhibitory role of IRF4 does in fact apply to MDP-mediated protection from colitis, since neither IRF4-deficient mice nor mice treated with siRNA specific for IRF4 were protected. These findings indicate that MDP activation of NOD2 regulates innate responses to intestinal microflora by downregulating multiple TLR responses and suggest that the absence of such regulation leads to increased susceptibility to Crohn disease. Citation Information: J Clin Invest. 2007. https://doi.org/10.1172/JCI32335.